The Lowa Ranger III GTX was highly praised by numerous reviewers for its true-to-size fit. Many owners didn’t need much convincing to call this backpacking footgear extremely comfortable. A good number of wearers applauded the boot’s outstanding ankle support. Several users couldn’t thank the Ranger III GTX enough for its relentless waterproofing. A gear critic regarded this boot as a good form of investment. This boot was given high remarks by a professional reviewer for its impressive surface traction. The level of lockdown security a footwear expert received from this Lowa gear and its lacing system was nothing short of exceptional. Less than a handful of wearers didn’t quite like the boot’s stock insole. One of them, a professional blogger, discarded it right away for being too forgettable quality-wise. An owner was quite disappointed with the Ranger III GTX’s heaviness. A reviewer mentioned that the forefoot was a bit narrow. It isn’t recommended for people with high-volume foot. Perhaps during their creation of the Ranger III GTX, Lowa engineers put special emphasis on comfort as the boot has substantial amounts of it. Fortunately, they didn’t settle for just comfort, because this superbly true-to-size footwear also has excellent waterproofing and ankle support. One thing about the boot that might irk some patrons, however, is its unamusingly plain default insole. Overall, the Lowa Ranger III GTX marches proudly with its synergy of fine qualities, and because of that should not be missed despite its ho-hum footbed. I can say a lot of people will be wearing these boots in the future. These boots are performing really, really well. I see many great miles ahead of me in this fantastic boot. Compared with the Ranger II GTX, the third-generation Ranger GTX has a slightly slimmer profile, especially around the shaft. That said, this latest Lowa offering is heavier than the previous model. The boot provides stability and underfoot cushioning thanks to its DuraPU midsole with SBS System. It comes with a stabilizer at medium rigidity for additional balance support. This version is still equipped with a Vibram outsole. This time, however, it is one Vibram Natural instead of its older sibling’s Vibram AppTrail. Making a welcome return from the old model is the boot’s iconic tongue stud (called X-Lacing system in this version). Its function of securing the tongue in place remains the same as seen in the Ranger II GTX. 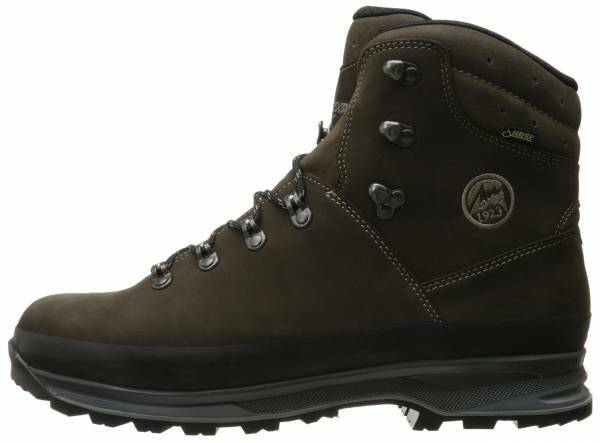 A fairly true-to-size, mid-cut backpacking boot for men is the Lowa Ranger III GTX. It comes in widths D – standard and 2E – wide. Its sizing options are quite decent, having a range of whole and half sizes. Getting a secure lockdown is through the boot’s lacing system. It is designed to allow for two separate tension settings—one for the instep zone and another for the shaft. The Lowa Ranger III GTX promises to help backpackers conquer virtually all sorts of terrain with its grippy Vibram Natural outsole. This trekking-specific, resolable component (meaning, the sole is replaceable), aside from its multi-directional lugs, features aggressively grooved heel and forefoot zones for extra ascent and descent control. In addition to traction, this proprietary outsole also doubles as the boot’s toe bumper. Aimed at maintaining the user’s balance with as much cushioning as possible is the Ranger III GTX’s DuraPU midsole. It is engineered with the SPS System—a technology that sees TPU inserts installed at key points for supination and pronation support. Boosting comfort for the user is the Lowa-exclusive Climate Control footbed. It can be trimmed to better suit the user’s cushioning needs. Lowa’s Ranger III GTX largely owes its tough looks and durability to its waxed nubuck leather upper. It has a 360-degree rubber rand at its base for scuff and abrasion protection. Its main liner features a Gore-Tex membrane for waterproofing. Its main defense against intrusive debris, on the other hand, is thanks to its gusseted (C4) tongue. A fairly straightforward classic lacing system completes the boot’s upper. It consists of synthetic laces, open hooks, roller eyelets, and the X-Lacing system—the tongue’s stud.